Fron Hen Circular Trail at Moel Famau / Clwydian Range (NRW)0300 065 3000workWalking RouteRising to a height of 554 metres (1818 feet), Moel Famau is the highest peak on the Clwydian Range summit chain. At the top lie the ruins of the Jubilee Tower, an iconic monument visible from all directions, with a wonderful outlook across North Wales and North West England. 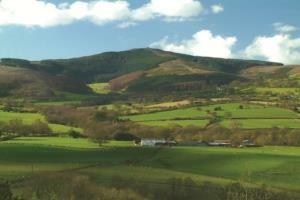 This trail is a walk around the lower ramparts of Moel Fenlli and on through farmland. It returns along the slopes of Fron Hen and through attractive mixed forest. Coed Moel Famau is three miles south west of Mold, signposted off the A494. From the north: take the A494 from Mold through the towns of Gwernymynydd and Loggerheads, until the junction with 'Moel Famau Country Park' signposted to the right. Follow this road for one mile, and the car park is on the right. From the south: take the A494 from Ruthin towards Mold. After passing through the village of Llanferres turn left at the junction with 'Moel Famau Country Park' signposted. Follow this road for one mile, and the car park is on the right. The OS grid reference is SJ 161 627. Rising to a height of 554 metres (1818 feet), Moel Famau is the highest peak on the Clwydian Range summit chain. At the top lie the ruins of the Jubilee Tower, an iconic monument visible from all directions, with a wonderful outlook across North Wales and North West England. The toilets are open from 8am to 6pm (October to March) and from 8am to 9pm (April to September). There is a charge for onsite parking. The permit costs £30 per year and is valid until the end of March each year.